Global financial markets maintain close relationships as international trade and commerce help bring us together in one world economy. Just as the effects of the strengthening economy in Brazil can be seen in Argentina, the effects of a credit downgrade in Greece or Ireland can be felt in the US. Within one nation, these inter-market relationships are especially important. Stocks & Bonds: On a day to day basis, investors constantly make the same decision; stocks or bonds? Each and every investor evaluates market and economic conditions, and places their capital in the investment vehicle that appears to offer the best return for the risk taken, ultimately driven by the two most powerful emotions; fear and greed. When times are good with high levels of employment, strong corporate earnings, and rising consumer prices, stocks tend to rise. Monies are withdrawn from savings accounts with the hopes of capturing superior returns as innovation leads equity markets to new lofty heights. Bonds fall out of favor and are forced to offer higher yields in order to compete with the euphoric effects of new 52-week highs only stocks can provide. In the glorious days of 2007’ as the Dow (Dow Jones Industrial Average) approached 14,000 the U.S. 10-year treasury bonds offered yields in excess of 5.00%. Conversely as stock prices suffered extensive losses reaching multi-decade lows in 2008’, feelings of greed quickly shifted to fear as the Dow touched lows below 7,000, the 10-year bond yields sank to levels nearly touching the 2.00% threshold. As bond yields rise, the actual price of the bond falls as the cost to pay this yield makes the bond less valuable, which is demonstrated in the following example: An investor purchases a Treasury bond offering a 3% yield, issued at $1,000 parity. The economy, stocks, and bond (yields) subsequently rise. New bond issues that now offer 5%, make those 3% bonds less attractive and therefore less valuable in the eyes of the investor. Stocks & the Dollar: The USD and Dow have enjoyed positive and negative correlations, at times moving in the same or opposite directions. Over the past few years under a low interest rate environment an opposite or negative correlation has persisted. As the USD tends to move under the anticipation of higher or lower interest rates, positive economic data leads the ‘market’ to believe the FED (Federal Reserve) is more likely to raise interest rates, and it is therefore logical to expect USD strength. The opposite also holds true; negative economic data may lead investors to believe the FED is less likely to raise rates or perhaps even lower borrowing costs which in turn may result in a weaker USD. However as interest rates are lowered to stimulate the economy, any (economic) news event that implies the FED is less likely to raise interest rates will ultimately benefit businesses as lower borrowing costs make it easier (less expensive) to borrow and invest capital as this climate also encourages consumers to return to the housing market, seek out financing, and put money to work within the economy. Furthermore, low rates make savings accounts and fixed income products (that typically move with interest rates) less attractive, all of which ultimately benefits corporate earnings and their respective stock prices, as investment capital finds its way into more speculative vehicles such as stocks, real estate, (commodities at times), and innovative start-up businesses. With that said, this opposite relationship between the DOW and USD did not always exist. In the years past under high interest rates, stock prices and the USD did enjoy a positive correlation as foreign investment capital that finds its way into US businesses, US stocks, and ultimately the USD. Therefore when searching for the relationship between stock prices and their respective currency (in this case the USD), it is important to make note of the current interest rate environment. USD & 10-year Gov’t Bond: The bond market possibly enjoys the closest relationship with its respective currency as both are closely linked to current interest rates. During prosperous economic conditions as consumer prices rise, the probability of the Fed raising interest rates also increases. To compete with rising stock prices the bond market (in order to stay competitive) will also offer higher yields. 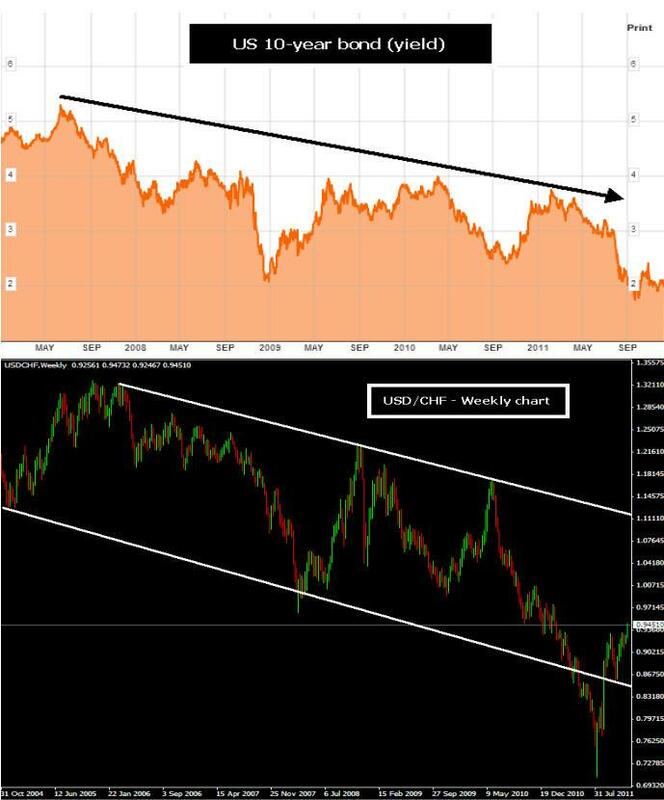 The following chart illustrates that despite a long-term trend to the downside, the USD (USD/CHF) behaves in similar fashion to the 10-year (US Treasury) bond market. At the height of the economic boom in 2007’, the 10-year bond offered yields in excess of 5.00% while the USD/CHF tested levels above 1.30. As stock prices reached their ultimate bottoms in the latter days of 2008’, the 10-year bond yields touched lows near 2.00% as the USD/CHF also reached the bottom of its near-term cycle dropping to levels near 2.50. Ultimately both the bond market (yield) and the USD move in anticipation of higher / lower interest rates, watching fundamental data, searching for signs of a change in economic conditions. Yet much has been said about the precipitous decline the USD has suffered over the course of the past few years, which actually is part of a much longer-term trend lower. This steady and long-lasting decline can be attributed to a number of macro-economic factors such as the amount of additional dollars that have been printed and injected into the U.S. economy, ultimately diluting the value of the USD against its major trading counterparts. In turn a weakening USD has contributed to the broad-base rise in commodity prices, as we simply require more USD’s to purchase a barrel of crude oil and ounce of gold. Nevertheless within the long-term USD trend to the downside, the shorter-term relationship between the USD and bond market remains. 10yr, 30yr, & bond spread: The bond market can also provide additional insight as we compare the behavior of different maturity issues over the same period of time. A longer-maturity bond (such as the 30-yr) will naturally pay a slightly higher yield as theoretically speaking, the investor is purchasing that bond for a greater period of time, and under normal circumstances we would expect better economic conditions as we look further into the future. For example in the latter part of 2009’, the 30-year U.S. Treasury bond offered a yield of approximately 4.20% while its 10-yr counterpart offered yields of approximately 3.20%. The ‘spread’ (difference between the two yields) at that time remained around 1.00%, or 100-basis points. (100 basis points = 1.00%). This ‘normal yield curve’ typically exists as investors expect the economy to continue to grow over time, and expect the economy to better in future than it is now. However at times the 10-year (yield) will decrease at a faster rate than the 30-year (yield) which indicates a bleak near-term expectation of economic conditions yet still forecasting better conditions looking further out into the future. There is enough text and analysis on ‘yield curves’ to fill entire libraries, however even at the most simplified level it is important to understand the behavior of similar bonds with different maturities. As we will typically expect bonds with longer-maturities (30-yr bonds) to offer higher yields than shorter-term bonds (10-yr), at times this relationship can be inverted. In fact an ‘inverted yield curve’ exists when the shorter-term bond actually offers a higher yield than the longer-term, and has been considered a signal of a future economic recession. Notice on the following chart how the 10-year bond actually offered a slightly higher yield than the 30-year in early 2006’; which gave us an early sign of what lay ahead. As we typically expect longer-term maturity bonds to offer higher yields than short-term bonds, at times both maturities will offer very similar yields. This can be considered a sign of future economic transition. Notice in late 2007’ & late 2008’ the ‘Spread’ (difference between 10 & 30 year bonds) fell (near zero) indicating both bonds offered a very similar yield, and occurred before massive changes in the economy and ultimately stock market prices, first to the downside, and then higher. Looking forward: It is of course impossible to know for sure what will happen in the future, and two investors can look at the same chart and come to very different conclusions, buy we can still make educated guesses based on how financial markets have behaved in the past. Comparing the Dow & 10-year bond (1st chart) we can see quite a divergence between the two markets. Based on the premise that both lines typically move fairly close together, we may come to the conclusion that either the Dow will move lower, or the 10-year bond (yields) will increase (or both will occur), as both lines once again draw closer together. If the 10-year bond yields appreciate this ‘may’ be the result of improving economic conditions, as a declining Dow ‘may’ forecast the expectation of lower corporate earnings. Furthermore the (2nd chart) shows the negative correlation between the Dow and USD. If we expect stock prices to move lower, this would most likely occur alongside a strengthening USD. Again, as the USD currently represents very low interest rates, traders may purchase the USD (like the JPY) as a ‘flight to safety’ as (stock) market conditions worsen, as capital is taken away from higher yielding currencies, such as the AUD & NZD. On the other hand, if we expect the 10-year bond (yield) to appreciate, the (3rd chart) shows how we may also expect a strengthening USD to accompany this bond (yield) rally. The (4th chart) currently shows a considerable spread between 10 & 30 year bond issues, which we normally would expect to occur. Major economic transitions can follow periods of time when these yields draw closer together, but current conditions do not tell us that. As the 30-year bond continues to pay a considerably higher yield than the 10-year, this tells us the bond market forecasts better economic conditions the further we look into the future. Although major changes in our economies occur quite infrequently and may not apply to most traders, especially those with a short-term outlook, the more information we have at our disposal can ultimately help us to become better traders / investors. As the old adage goes…”The trend is your friend”, we can use this analysis to ensure that we find ourselves on the right side of the trade. Furthermore, long-term market analysis can help us identify possible changes in economic conditions, and help us prepare for the future which always offers us the unknown. We wish you the best of luck in all your trading endeavors.